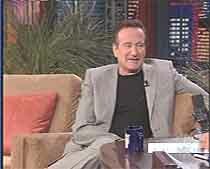 Frankly, I have seen my last Robin William's movie and will oppose him and Jay Leno at every opportunity. I just received this from Tim Staples. New York, Jun 20, 2007 / 10:14 am (CNA).- Robin Williams has decided that he won’t pay any consequences for ridiculing the Church in public, says The Catholic League. On Monday night’s Tonight Show with Jay Leno, Williams equated all priests with pedophiles and mocked confession. Leno invited the actor on to his show to plug his upcoming movie “License to Wed,” in which he plays a Protestant minister who forces a couple to go through marriage preparation courses. However, the experience of portraying a minister didn’t seem to engender any respect for the clergy in him.